The idea of sandcastle building brings many adults back to their childhood days spent watching their sand moats fill with sea water and hollowing out canals to flood a pesky sibling’s structure. Sandcastle building has stood the test of time as a favorite family beach activity. Though it may have been some time since you’ve built the perfect sandcastle, a family vacation to our Siesta Key vacation rentals might just be the perfect time to pass on your skills to the next generation. 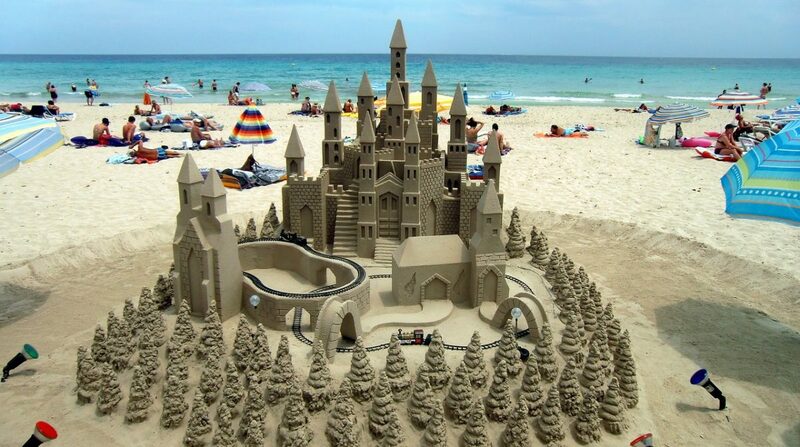 Consider this your official guide to sandcastle building on the beaches of Siesta Key. After you have been to enough beaches around the country, you start to see them fall into a few categories. While some sand is dark, rough, and pebbled, and other sand is less course, Siesta Key is home to some of the most stunning soft quartz white-sand beaches anywhere, which makes sandcastle building here a particular treat. The sand is made up of 99% quartz, a crystalline mineral that is very soft to the touch and stays cool to the touch even when the sun is out in full force. But don’t think that this soft sand can’t hold its shape to build houses, castles, moats and other creative sculptures. Come prepared with tools. While your hands will do for a basic castle, more intricate structures might require a small sand trowel, large bucket for water, paint stirrer for smoothing and sketching, a small flat wooden stick for tapping out air, spatula and plastic knife for carving, spoons to make windows, and straws to blow away excess sand. Draw an outline in the sand where you want your sandcastle to stand and shovel sand from the outside of the lines to form a mound to start with. Make the pile slightly taller than the first floor of the castle. Use a shovel or trowel to pack the sides of the mound to form walls at your preferred height. Pour water in the center of the sand mound to form a pond and jump on it to get the sand to absorb the water. Add more water and repeat until the middle of the mound is the same height as the walls. Due to the year-long warm weather, beautiful beaches, and abundant tourism, Siesta Key has become home to some of the most spectacular sandcastle building competitions. Popular for families, you learn a whole lot about sandcastle construction by observing the builders, experts and amateurs alike, at these competitions. The Siesta Key Crystal Classic Master Sculpting Competition, held annually in November, draws only the best professional sand sculptures in the world. In order to enter, sculptors must have already won a recognized international contest. About 25 competitors sculpt in teams, vying for the top prize. About $9,000 is given out each year to the top contestants. Participation in this contest is limited to professionals, but it makes for an exciting family-friendly attraction while on vacation in Siesta Key to view the remarkable structures which are photographed for top publications. If you’re looking to compete, the Siesta Sand Sculpture Contest, held each year in May, might be your chance. Now in its fourth decade, this competition is open to the public and the stakes aren’t quite as high. The creations are entertaining, silly, and always creative. The competition is open to all ages, and families can register as a group. The event takes places on Siesta Beach just south of the pavilion, near many Siesta Key vacation rentals. Regularly named the best in the U.S., Siesta Key beaches have a lot of offer. The small coastal wonder attracts travelers from all over with its fun local activities, family-friendly events, and outdoor attractions. If you’re visiting Siesta Key with your family this season, be sure to pass on the joy (and skills) of sandcastle building to your kids.